This Thursday and Friday I will participate in a meeting that will address the topic of whether ATS should have an annual (or other regular) conference for Educational Technologists similar to those they have for development officers, CFOs, Deans, Registrars, and possibly some other conferences I don't know about. I feel a bit odd about this because (1) I am not trained as an educational technologist, though sometimes my job calls for such, and (2) despite that last clause, most of my work involves being the helpdesk, the sysadmin, the database administrator, and the network admin. On the other hand, I've spent the last few years looking for a conference where schools the size of AMBS would be out in force, and a conference for educational technologists would likely fit the bill. Mayhaps I can put in a plug for some workshops on how to do educational technology when most of your job activities involve troubleshooting rather than course design. So that's one thing that I've been thinking about only informally. The other thing: the outgoing Dean told me I should make a presentation to the faculty about open source education. As he used the term, this means something more along the lines of MIT's OpenCourseWare than it does using Open- instead of Microsoft Office. So I've been contemplating the following: What sorts of things constitute "open source" education? Simply making syllabi available? What about lecture notes? Where does intellectual property fit into that? Is there such a thing as IP -- or should there be? Can I work in a computer lesson or two into this? What about some annoying (and ubiquitous) monikers: Web 2.0? Education 2.0? That thinking led, today, to this line of thinking about technology, specifically as relates to a "the cat's out of the bag" (or, more precisely, "the horse is out of the barn"): What barn did the horse leave? And where did the horse go? Into the meadow? Into another barn? What does that barn look like, and do we want the horse to stay there or leave? If closing the first barn door will do no good where technology is concerned, are we somehow obligated to keep all barn doors open so the horse can go hither and yon at will, or should we maybe consider closing this new barn door? Whatever it is? Well, almost. 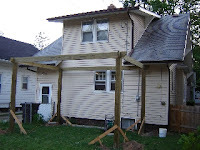 I still need to add some lateral bracing so as to reduce the amount of sway on the long side, but, as you can see from the pictures below, the pergola is pretty much complete. We even transplanted the grapes. To the right is a shot of the pergola from the garage. The scrap wood near the back door is what remains of the previous, inadequate, trellis. 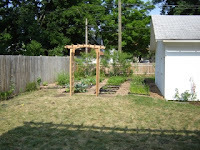 This is a view of the garden from the pergola. 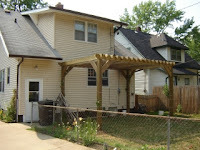 And, yes, you see another pergola. The nicer-but-smaller one will have a rose growing on it sometime. Phase II of the project is to put a patio under the Big Pergola (BP) and a stone paver walking path from the BP to the Little Pergola (LP). That's set, tentatively, for Summer, 2008. It's not finished yet, but you can kind of get a sense of where it's going. 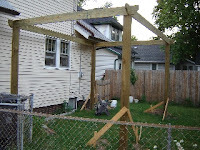 The first image is just the frame of the pergola. The second image attempts to get a little perspective as it relates to the house. This is going to change the feel of our backyard dramatically, methinks. You'll note that this time I appear to have measured correctly. Ahem. Oh, the measurements, in case anyone wonders (working clockwise from the nearest post in the first picture): 131 1/4" x 179 3/4" x 131 5/8" x 179 1/2". So it's not quite square, but I'm pretty certain only a very few people will notice the 1/2" difference on the short end, and even fewer will notice the 1/4" on the long edge. Except that now I've told you all.